An unexpected storm has left you shipwrecked on a mysterious and remote private island. 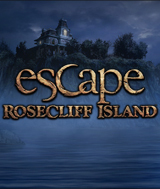 Seek & find cleverly hidden objects and solve puzzles to find a way off the island. Find over 2,100 hidden objects in 25 intriguing and mysterious locations to find items that will help you escape. Comments: I think I've played this one a few times too many. The graphics are great and the HO are great. If you make it to the end, there is a final brain twister but take a deep breath and concentrate. I's easier than it looks.